HÀ NỘI — Deputy chairman of the Việt Nam Football Federation, Trần Quốc Tuấn, said that Việt Nam has a shot at competing in the World Cup 2030. Tuấn said this following the appointment of Manchester United (MU) legend and former Wales international Ryan Giggs as director of the Promotion Fund of Vietnamese Football Talents (PVF) youth football academy in the northern province of Hưng Yên on November 20. At the opening ceremony of the PVF football academy, Giggs said his aim was to train Vietnamese footballers to compete in the World Cup 2030. Attending the ceremony in Hưng Yên, Tuấn supported Giggs’ goal. He said Việt Nam’s ability to compete in the biggest football tournament in the world will be possible if Vietnamese teams continue their string of successes. “In 2030, FIFA will increase the number of teams that can participate in the World Cup, so all countries have an equal opportunity,” said Tuấn. “We believe with the foundation of PVF academy alongside other centres such as Hoàng Anh Gia Lai and HCM City, the quality of young Vietnamese footballers will be better, contributing to strengthening the national teams. I hope Việt Nam can play in the World Cup 2030,” said Tuấn. In the past two years, Việt Nam has had representatives in Asian tournaments, especially futsal and the U20 football team earned the rights to participate in the World Cup. In 2018-19, Việt Nam will have six teams taking part in the Asian events. 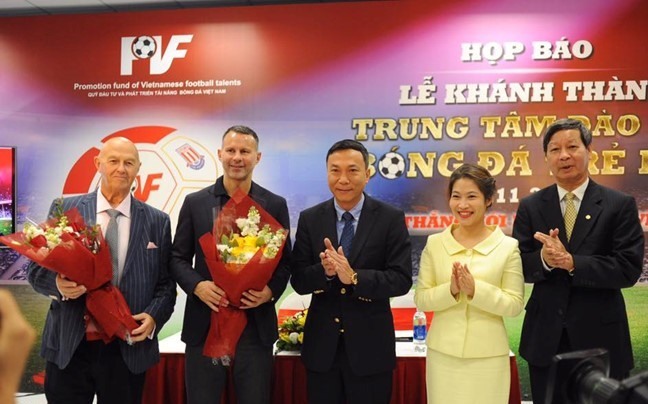 The 43-year-old football star, Giggs, will be responsible for coaching players, training coaches and participating in building and developing PVF to become the leading youth football training centre in Việt Nam, in line with famous football academies across the world. Paul Scholes, another Manchester United legend, has also been appointed as a technical consultant for PVF. Head coach of Việt Nam’s U19 team, Hoàng Anh Tuấn, is head of the training board at the academy. Giggs said the training board along with him would draw plans on training and nutrition for footballers and inculcate in them the thirst for victory. He said he would use his over 20 years of competing and two years of training work in MU to help the young Vietnamese players. The 22ha PVF academy is considered one of the leading football institutes in Southeast Asia with modern equipment and facilities.